According to The Sports Corner website, show hours are from 10:00 a.m. to 4:00 p.m. Admission $8 children under 10 free. Rick Barry from 12:00 p.m. to 1:00 p.m.
Bob Lilly from 1:00 p.m. to 2:00 p.m.
Grant Fuhr from 1:00 p.m. to 2:00 p.m. Pro Basketball great Rick Barry played for both the ABA (American Basketball Association) and the NBA (National Basketball Association). His career included playing for the Golden State Warriors, the Houston Rockets, the New York Nets, the Washington Caps, the Virginia Squires and the Oakland Oaks. He was the NBA Rookie of the Year in 1966, and eight-time NBA All-Star in 1966, 1967, 1973, 1974, 1975, 1976 and 1978 plus he was a four-time ABA All-Star in 1969, 1970, 1971 and 1972. NFL Hall of Famer defensive tackle, Bob Lilly played for the Dallas Cowboys. He was inducted into the Pro Football Hall of Fame as well as the College Football Hall of Fame in 1980. Lilly began his career as a defensive end, but midway through his third season, Cowboys coach Tom Landry moved him to defensive tackle. As a tackle, Lilly was a first-team All-NFL choice every year from 1964 through 1969, then again in 1971 and 1972. The Cowboys won the 1972 Super Bowl against Miami and his sack of quarterback Bob Griese is one of the most memorable plays in Super Bowl history. Grant Fuhr is a former NHL goalie and Hall of Famer who played for the Edmonton Oilers, the St. Louis Blues and the Buffalo Sabres. In 2003, Fuhr was inducted into the Hockey Hall of Fame. He played for the Oilers for ten seasons, where he teamed up with Andy Moog for several of them to form one of the most formidable goaltending tandems in history, and won five Stanley Cups. He was the team’s starting goaltender on the first four teams. PFP Sports & Celebrity Talent Agency is a top booking agent for motivational sports speakers and celebrities. 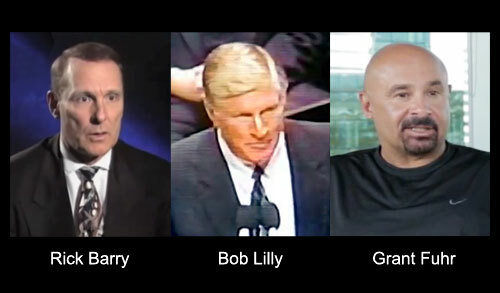 If you would like to book NBA stars like Rick Barry or NFL stars like Bob Lilly or NHL stars Grant Fuhr for a speaking engagement, personal appearance or special event, you can request Rick Barry Bob Lilly or Grant Fuhr agent and speaker information from PFP Sports & Celebrity Talent or call 800.966.1380.